Welcome to 2016! For many, this means New Years Resolutions. For me, I’ve never been a fan of them. If you don’t make them, you can’t break them, right? Last New Years Eve, I gathered with a group of friends. One of them mentioned how she heard on the radio that instead of making New Years Resolutions, people were encouraged to focus on just one word. As we went around the room to share our one word, I knew what word I wanted to focus on for the upcoming year. It was a word that had been on my mind quite a bit: OBEY. During 2015, I focused on obeying God’s promptings. Some were easy to follow, but most of them were challenging. Each time that I obeyed, though, I was encouraged to take the next step. The toughest steps were also the ones which eventually led me to experience more peace and healing. I started thinking about what I wanted my one word to be for 2016. This year, my one word is: SHARE. Encouragement – We could all use some of this! 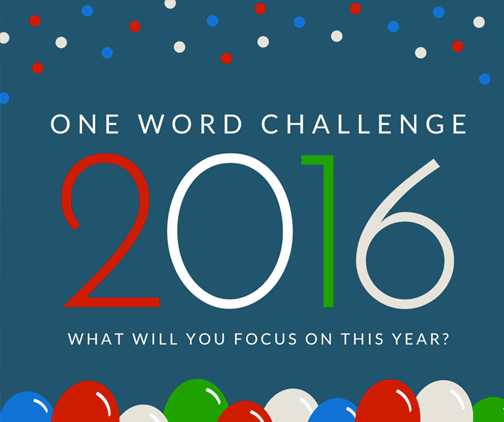 What word will you pick to focus on for 2016? What a great word to focus on!